As a partner in your home remodeling project, DreamMaker Bath & Kitchen of Charlotte is a company with a powerful Code of Values™ that we take very seriously. Whether you are looking for a traditional kitchen remodel or custom bathroom remodel, our adherence to the philosophy of the company can give you confidence that we will do what it takes to complete your project to your satisfaction. 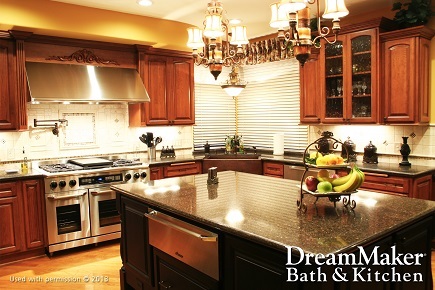 Since its inception in 1975, DreamMaker Bath & Kitchen’s philosophy has always focused on people and treating them with respect and integrity throughout the course of a remodel. By providing superior service to our customers, our community and to our team members, DreamMaker has become a leader in the remodeling industry. The company’s name has changed to reflect what we do, but our Code of Values always remains the same. Our desire to earn and maintain your trust from the beginning to the end starts with a multistep approach. You’ll first meet with a DreamMaker designer in the design center, where you can discuss your goals for your kitchen, bathroom or other space. The next step is for the designer to visit your home to complete a survey of the rooms where the work will be done. Once the survey is completed, the designer will draft and share designs that have been carefully crafted for your specific project, and let you know the cost. Once you are satisfied with the plans, you’ll sign an agreement that details the timeframe of the project and what will be done. From there, you will move on to the pre-start conference meeting, where you will review the schedule as well as the construction and installation processes. Throughout the project, you will have a DreamMaker project manager who will be your point of contact to keep you informed and coordinate all of the professionals involved. You can rest assured that all of your questions will be answered, and you will end up with the kitchen or bathroom of your dreams. To begin the process of creating your dream kitchen or bathroom, call DreamMaker Bath & Kitchen of Charlotte at (704) 270-2166 or submit our online form to start a conversation.